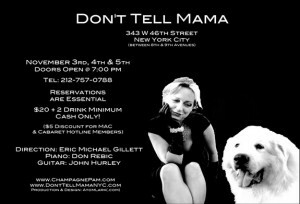 Vocalist Champagne Pam, the Dog Walking Diva had the audience eating out of her palm last night at Don’t Tell Mama, New York’s legendary cabaret room. With a song list that ranged from jazz to R&B to original songs, every note was a little drop of love for the clients she so adoringly tends to day after day … the dogs who depend on her, love her unconditionally and occasionally steal her heart. Backed by a terrific pair of musicians: Donald Rebic on piano, and John Hurley on guitar, Champagne Pam’s voice is given free reign to seduce the audience note by note, song by song with her between-song-patter being kept at enough of a minimum to not turn this into a one-woman-show-with-tunes but rather keep this as it should be – a night of smoky chanteuse numbers that revolve around a theme. The theme – which this Diva simply reworks to a finer and finer point as each new song is introduced – is, as her moniker might imply, dogs, dogs and more dogs. Though animal lovers might find a kindred spirit on stage you need not be a member of PETA to find Pam’s tale of tails engaging, charming, alluring and yes, even touching. Think back to the purity of Jimmy Stewart on the Johnny Carson show reading his poetry dedicated to his dog Beau and you’ll understand the underlying love that drives this show and makes every song a winner. This is a gal who loves what she does and has allowed each little pooch to help redefine the daily ins and outs of her life. 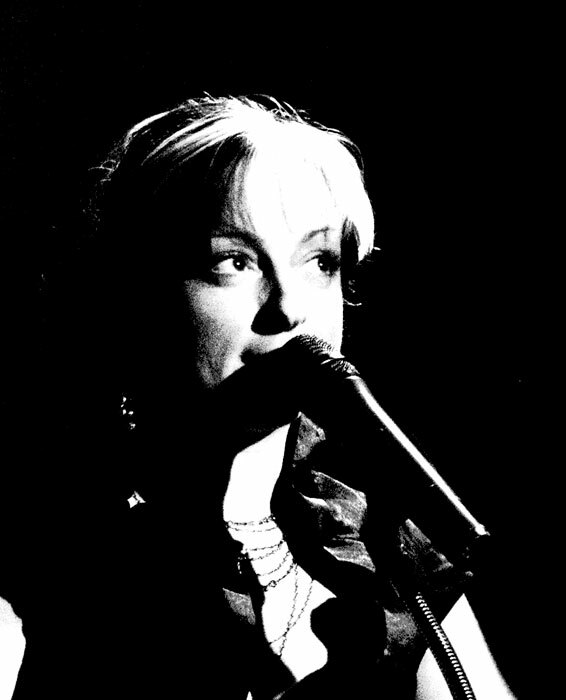 As for the thing that makes or breaks a good cabaret act – the actual vocals – Pam delivers the goods, and how. Her voice twists, turns, soars, belts to the rafters and coaxes from behind the sultry corners of her persona, all of it mixing up in a delightful frothy cocktail that had the audience falling in love. Rebic’s fantastic piano and Hurley’s bluesy guitar are the perfect accessory to Pam’s smoky voice, taking a back seat and letting her shine center stage. However there are also moments when the wonderful arrangements and artistry of these musicians transform a song from just a simple ditty into a downright gem. With old standards such as “Them There Eyes”, “Just In Time”, “Hurts So Bad”, “Tracks of My Tears” mixed in with some songs obviously written for the show, there isn’t a moment when Pam isn’t delighting the crowd. Though her stint at Don’t Tell Mama is brief, catch this show while you can. You’ve got one more night to toast with Champagne Pam.